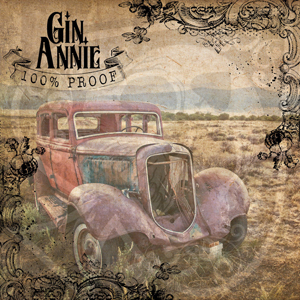 GIN ANNIE are a hard melodic rock 5-piece from Wolverhampton, England, featuring heavy guitar driven songs whilst maintaining a melodic vocal style; featuring hook-laden choruses and classy melodies. They are based around the nucleus of cousins, Dave Foster (vocals) and Byron Garbett (guitars). In November 2017, the Black Country rockers saw a change of line-up to form MKII of the band, with the addition of Brian Green on guitar and Phill ‘Hammer’ Burrows on bass. Drumming powerhouse Jack Ryland-Smith completes the group. They signed to TMR Management in Nov 2017 and will release their debut album 100% Proof released on Fri 25th January 2019 through Off Yer Rocka Records. Check out the band's video for "Chains" on KNAC.COM HERE. You will be able to see them live on tour across Europe with DIAMOND HEAD in October & November and at Planet Rockstock and London in December.